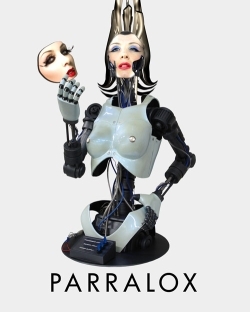 Fresh from mainstream acclaim (“Listen to this: it cuts!” – Perez Hilton), electronic band Parralox return with a new maxi-CD. The Isn’t It Strange EP (Conzoom Records) features fifteen tracks with a total running time that’s just shy of the full 80 minutes possible on silver disc. It’s also on download of course, but the limited edition CD is well worth the purchase for the exclusive tracks. Listen Here or read on for more. The Parralox of John von Ahlen and Amii released album State of Decay at the tail-end of last year and it rapidly worked its way into my Top 20 Synthpop Albums of the Year. I placed it at number 6 then as it was still a new release and I hadn’t had a chance to absorb it fully. It would certainly be higher now. Isn’t It Strange is the third and best in the trilogy of maxi-EPs from the album. For once, here’s a CD of mixes that I listen to from start to finish without skipping any of the mixes. Even though there are in total nine versions of the title track, accomplished remixers like Ade Fenton, Beborn Beton, and Talion Law each bring something different to their mix. But there’s also seven other songs: this EP is more like a full remix album. Isn’t It Strange (Ade Fenton Remix Extended) – Gary Numan‘s mate kicks off the disc with this slick mix. Isn’t It Strange (People Theatre’s Snowball Mix Extended) – this People Theatre mix reminds me of when Depeche Mode still had Alan Wilder. 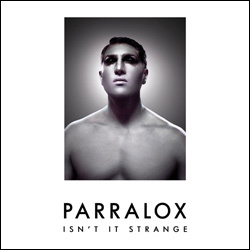 Isn’t It Strange (Vision Talk Synthpop Remix) – an aptly named mix, this is the most synthpoppy track on the CD. Moonwalking (Beborn Beton Remix Extended) – great to hear Beborn Beton again and a great remix. Isn’t It Strange (11am Remix by AUX) – one of my favourites on the disc, this is like a slowed Covenant or And One track. Empty (Moog vs Linn Remix) – the first of several exclusive tracks, John steps up as co-vocalist on this very 80s sounding electrik dream. Isn’t It Strange (Orchestral Full Length) – switches off the electronics and brings in a String Quartet from the Victorian College Of The Arts. Amii’s vocals come to the fore and the strings reveal a subtler, more melancholic side to the song. When The Walls Came Tumbling Down (PT’s Born Again Mix) – this mix has added piano for a housey Are You Spotified? type feel. Don’t Listen To Me (Extended) – this track totally rocks, it’s got Human League Sound of The Crowd blood: my favourite! Kangaroo Island – closing with a march and a slight return to the classical sound from earlier. It’s a great way to end the disc and proves that even the running order lends this “EP” to album status. So those are my thoughts: synthpop fans will love this release, and there’s lots for “normal” music fans too. Parralox are touring Europe this summer with a couple of dates planned in the UK including the renowned Infest festival in Bradford. Hopefully see you there! Disclaimer: my name is in the CD booklet of the Isn’t It Strange EP only because I pre-ordered it. Artwork and logos copyright Parralox 2010.